Maximum-likelihood semi-blind joint channel estimation and equalization for doubly selective channels and single-carrier systems is proposed. We model the doubly selective channel as an FIR filter where each filter tap is modeled as a linear combination of basis functions. This channel description is then integrated in an iterative scheme based on the expectation-maximization (EM) principle that converges to the channel description vector estimation. We discuss the selection of the basis functions and compare various functions sets. To alleviate the problem of convergence to a local maximum, we propose an initialization scheme to the EM iterations based on a small number of pilot symbols. We further derive a pilot positioning scheme targeted to reduce the probability of convergence to a local maximum. Our pilot positioning analysis reveals that for high Doppler rates it is better to spread the pilots evenly throughout the data block (and not to group them) even for frequency-selective channels. The resulting equalization algorithm is shown to be superior over previously proposed equalization schemes and to perform in many cases close to the maximum-likelihood equalizer with perfect channel knowledge. Our proposed method is also suitable for coded systems and as a building block for Turbo equalization algorithms. Next generation cellular communication systems are required to support high data rate transmissions for highly mobile users. These requirements may lead to doubly selective channels, that is, channels that experience both frequency-selective fading and time-selective fading. The frequency selectivity of the channel stems from the requirement to support higher data rates that necessitates the usage of larger bandwidth. Time selectivity arises because of the need to support users traveling at high velocities as well as the usage of higher carrier frequencies. It is therefore an important challenge to develop high-performance equalization schemes for doubly selective channels. Doubly selective channels can rise both in single-carrier systems and in Orthogonal Frequency Division Multiplexing (OFDM) systems. In single-carrier systems, the doubly selective channel is modeled as a time-varying filter and introduces time-varying Inter Symbol Interference (ISI). In OFDM systems, the time selectivity of the channel destroys the orthogonality between subcarriers and introduces Inter Carrier Interference (ICI) while the frequency selectivity of the channel causes the ICI to be frequency varying. In this paper, we concentrate on single-carrier systems only. The problem of equalization for doubly selective channels has been extensively researched. Several methods for only training-based-equalization were proposed in [1, 2]. Semi-blind equalization methods, that can benefit from both the training and data symbols, were proposed based on linear processing [3, 4] and Decision-Feedback Equalization (DFE) . However, the performance of these equalization methods may not be satisfactory, especially when only one receiving antenna is present . Moreover, the constant advance in processing power calls for more sophisticated equalization schemes that can increase network capacity. Maximum-likelihood detection based on the Viterbi algorithm is a widely known technique for slowly fading channels. For higher Doppler rates, this method is not satisfactory due to the inherent delay in the Viterbi detector which causes the channel estimator part not to track the channel sufficiently fast. A partial remedy is offered by the Per Survivor Processing (PSP) approach, proposed originally in  and justified theoretically from the Expectation-Maximization (EM) principle in . Using the PSP approach, the channel estimation is updated along each survivor path each symbol period using Least Mean Square (LMS) or Recursive Least Squares (RLS) . However, for high Doppler rates, the performance is limited as these algorithms are not able to track fast fading channels . Improved performance can be gained by using Kalman filtering [9, 11–13] but this approach requires the knowledge of the channel statistics which is normally not known a priori and its estimation will likely not be able to track fast fading. Low-complexity alternatives to the PSP were also proposed [11, 14]. Fast time-varying channel estimation might be achieved using the basis expansion (BE) model . In this method, the channel's time behavior is modeled as a linear combination of basis functions. Basis functions can be polynomials , oversampled complex exponentials [2, 16], discrete prolate spheroidal sequences , and Karhunen-Loeve decomposition of the fading correlation matrix . Several receiver structures were proposed based on the combination of the BE with Viterbi algorithm variants like PSP , -algorithm , and minimum survivor sequence [6, 18]. One common drawback of these methods is that the channel estimation part uses only hard decisions and does not weight the probability of different hypothesis for the symbol sequences. Moreover, all of these methods provide only hard decisions outputs which make them unsuitable for coded systems. In order to enable the channel estimation part to benefit from soft decisions, several MAP-based algorithms combined with recursive, RLS-based, channel estimation were proposed [19–22]. The combination of MAP decoding and maximum likelihood channel estimation can be justified using the EM principle. This leads to an iterative detection and channel estimation algorithm based on the Baum-Welch (BW) algorithm, proposed in  and modified for reduced complexity in  for non-time-varying channels (See  and references therein for more non-time-varying semiblind equalization methods). Adaptation for doubly selective channels is found in  based on incorporation of LMS and RLS in the algorithm. Iterative MAP detection combined with polynomial BE was proposed in . Unfortunately, this method cannot be directly extended to higher order BE models required in high mobility environments because the choice of polynomial expansion creates numerical difficulties for higher BE models. Furthermore, the equalization and channel estimation in  are done in a two-step ad hoc approach which is not a true EM (see Appendix A) and exhibits degraded performance in our simulations. Finally, Turbo equalization schemes, encompassing iterative detection and decoding, were proposed based on RLS/LMS channel estimation [22, 26] and BE channel estimation . The latter method employs a low-complexity approximation to the MAP algorithm for the detection part. It requires, however, that the channel statistics is fully known a priori. In this paper, we present a novel method for semi-blind ML-based joint channel estimation and equalization for doubly selective channels. The method is based on an adaptation of the EM-based algorithm for doubly selective channels by incorporating a BE model of the channel in the EM iterations. Using the BE method, we can simultaneously use long blocks thereby enhancing the performance in noisy environments without compromising the ability to track the channel because of the usage of sufficiently high-order BE to model the channel time variations. The proposed method is shown to have superior performance over previously proposed methods with the same block size and number of pilots in the block. Alternatively, it requires a lower number of pilots to achieve the same performance thereby enabling more bandwidth for the information. In addition, it is shown to have good performance for relatively small blocks, which is important if low latency in the communication system is required. The proposed algorithm outputs are the log-likelihood ratios (LLRs) of the transmitted bits, making it ideally suited for coded systems and also suitable as a building block for Turbo equalization algorithm that iterates between detection and decoding stages to improve the performance further. We treat the case of uncorrelated channels paths which is the worst case in terms of number of required BE functions. In Appendix B, we discuss the generalization to correlated paths. Another contribution of the paper is the determination of a pilot positioning scheme that improves the equalizer's performance. In the context of our proposed algorithm, the main purpose of the pilots is the enablement of sufficient quality initialization of the EM iterations so that the probability of convergence to a local maximum is minimized. 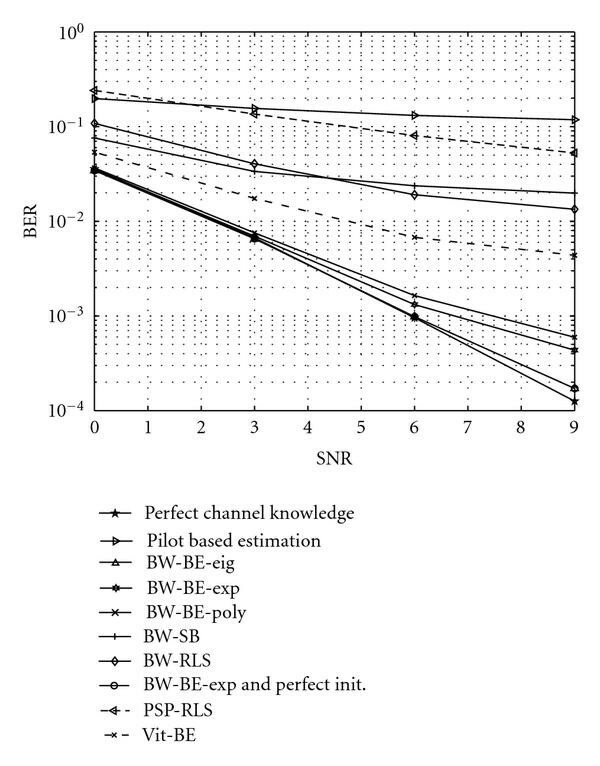 To that end, we propose an initialization scheme based on a small number of pilots and find the optimal pilot positioning such that the initial channel parameters guess is as close as possible to the channel parameters obtained assuming perfect knowledge of transmitted symbols (this is the channel estimation expected at the end of the BW iterations). It is shown that the pilot positioning depends on the channel's Doppler. For high Doppler rates, our results indicate that spreading the pilot symbols evenly throughout the block leads to the best initial channel guess. This result is surprising as it is different from previous results where the optimal positioning scheme was found to be spreading of groups of pilots whose length depended on the channels delay spread [29, 30]. These previous results, however, were obtained using different criteria and channel model. More importantly, the analysis in these papers was restricted and did not consider pilot groups shorter than the channel's delay spread as done in this paper. Therefore, these previous results do no contradict with our new result. Pilot positioning was discussed in [31–33] and conditions for MMSE optimality of both the pilot sequence and positioning were derived. The resulting sequences and positioning are, however, less attractive for practical implementations. This is because most of them require that the pilots and data overlap in time which complicated the receiver structure. The only optimal scheme proposed in [32, 33] with nonoverlapping pilots and data requires a pilot pattern that results in very high peak to average transmission which is not desirable in practical communications systems. In contrast, we optimize the pilot positioning given a predefined pilot sequence (in this paper we use, as an example, Barker sequence). This allows us to derive optimal pilot positioning for a given pilot sequence that meets some other constrains (e.g., constant envelope signals, low peak-to-average ratio, etc.). The rest of the paper is organized as follows. In Section 2, we present the system model and introduce the BE model. In Section 3 we present our proposed method for semi-blind joint channel estimation and equalization for doubly selective channels. Section 4 discussed the BE functions set selection. Our results regarding optimal pilot placement are presented in Section 5. Section 6 presents our simulation results and conclusions are drawn in Section 7. Partial results of this work were introduced in a conference paper . where is the received vector (observation vector) and represents a branch (transition) on the trellis formed by the channel's memory . There are possible branches at each time sample . Each possible branch is denoted by the row vector where and . Finally, is an Additive White Gaussian Noise (AWGN) sequence with zero mean and an unknown variance . where is the communication system carrier frequency, is the user's velocity, is the speed of light, and is the time of one symbol. where is the zero-order Bessel function and is the time difference in sample units. Furthermore, is the average power of the th channel path and the power profile of the channel is . In addition, we make the following standard assumptions. Information symbols, channel realization, and noise samples are statistically independent. The channel's paths are statistically independent (uncorrelated scattering ). In this section, we present our new algorithm for semi-blind maximum-likelihood joint channel estimation and equalization for doubly selective channels. We treat channels with uncorrelated paths as this is the worst case in term of number of required basis functions in the BE description. In Appendix B, we extend the algorithm for channels with correlated paths. The values of are efficiently computed using the Bahl-Cocke-Jelinek-Raviv (BCJR) algorithm . For non-time-varying channels, we have and (11) reduces to equation (11) in . Our algorithm may also be extended to channels with correlated paths. In this case, the number of BE parameters used for describing all channel's paths may be reduced. In that sense, uncorrelated channels paths may be considered as the worst case. The correlated case is discussed in Appendix B. Adaptation of the above algorithm to the semi-blind case where we have some known pilot symbols is straightforward. The only required change is in the computation of using the BCJR algorithm. We modify the branch metrics so that all transitions that are not consistent with known pilots are assigned zero probability. This ensures that transition probabilities are calculated with the a priori information about the pilots. Optimization of the EM objective function (8) is a nonlinear process that may converge to a local maximum. It is therefore important to calculate good initial guess for the channel parameters so that the probability of convergence to a local maximum is minimized. We suggest using the available pilot symbols for finding initial channel parameters using the following method. First, we run the BCJR algorithm where the branch metrics are initialized without any initial channel guess by assigning zero a priori probability to all transitions that are not consistent with the known pilots and equal (nonzero) a priori probability to all transitions that are consistent with the pilots. This initialization of the branch metrics represents our best a priori knowledge about the transitions probability in the trellis. From the BCJR algorithm we find and then use them in (11) to obtain an initial guess for the channel BE parameters. More details on this initialization method can be found in Appendix C.
An important feature of this initialization scheme is that all observations that have some content of pilots in them are taken into account including those with mixed pilot and data contributions. This is in contrast to most other pilot based estimations that take into account observations based on pilots only . This fact turns out to be significant when we discuss how to position the pilot symbols in the block in Section 5. It should be noted that the above algorithm requires initial synchronization stage to ensure that all major channels taps fall within the searched multipath window. This synchronization stage can be done at a much lower rate than channel estimation update, as the channel tap positions typically drift at a much slower rate compared to the fading rate, and therefore its complexity is negligible. The synchronizations stage is outside the scope of this paper and we assume perfect synchronization throughout the paper. The computational complexity of the updating equations (11) and (12) is analyzed in Table 1, where we have broken the calculation to several stages and counted the number of complex Multiply-And-Add operations (MAC) for each stage. For comparison, the equivalent complexity of  can be obtained from the same table by eliminating the stages for calculating , and . For (11), it can be seen that for the typical case of , the stages of calculating and are more computationally complex than the stages of calculating and , respectively. For (12), it can be seen that the second stage of calculating is more complex than the first stage of calculating . Finally, note that all the computationally complex stages of , and do not depend on and therefore their complexity is the same as in . We may therefore conclude that the proposed algorithm extends the Baum-Welch algorithm  for doubly selective channels with only minor increase in complexity. The functions in (14) model the channel time behavior as polynomial in time. This choice of basis functions may be regarded as a generalization of the channel description in  where it was suggested to use first- and second-order polynomials to model the channel time variations. Out of all eigenvectors, the vectors that correspond to the largest eigenvalues are selected as the basis set. The target function in (15) is suitable for flat fading channel. For frequency-selective channel, the mean square error will be simply the sum of the mean square errors of the individual paths and therefore the same solution is optimal for multipath channels. We note that a similar argument is given in . An obvious alternative to the equalization approach we propose in this paper is to divide the data block into small subblocks such that the channel can be considered approximately constant within a subblock period and then equalize each subblock separately using the Baum-Welch algorithm for non-time-varying channels . Interestingly, this subblock scheme can be considered as an instance of the BE approach if we choose basis functions for subblocks where the th basis function is equal to one in the symbols time that correspond to the th subblock and zero elsewhere, that is , where is a vector on ones. To justify our approach, we would like to compare it to this subblock approach. where and Tr are expectation and matrix trace operators, respectively. Figure 1 plots the required number of basis functions (rank of ) so that the mean square error in (17) is lower than 1% error. As expected, using the eigenvectors as basis functions leads to the lowest number of functions. 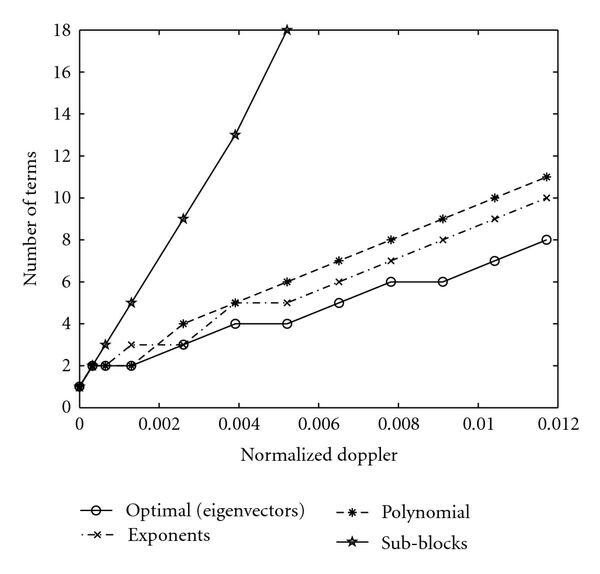 The polynomial basis set is shown to be quite close to the optimal eigenvectors solution for low normalized Doppler while for high Doppler rates, it is more beneficial to use the complex exponentials basis. The sub-block-based basis functions performance is much worse. This is not surprising as these basis functions do not utilize the correlation between subblocks and force a noncontinuous description of the channel in contrast to the channel's typical behavior. The results shown in Figure 1 confirm that this choice of basis functions is not suitable for Rayleigh fading and provides an explanation to the degraded performance of the subblock method shown in the simulation results section. Required number of basis functions for mean square error less than 1%. Block size = 256.
where is a vector of the pilot positions in the block. The maximum function in (23) and expectation in (24) are taken with respect to the data symbols, noise, and channel realizations. Using these criteria, it might be possible to optimize both the pilots positions and the pilot patterns. We, however, select known pilot patterns (e.g., Barker sequences) so that we keep constant envelope signals and optimize the positioning for this given pilot pattern. The usage of these two criteria is detailed in the next sections. Interestingly, both criteria lead to the same positioning scheme for high Doppler rates. where is the vector of eigenvalues of the matrix . The second equality follows from the fact that for flat fading channels and (Assume that is eigenvalue of , that is, , define , then and . Matrices and have therefore the same eigenvalues). The matrix is a deterministic function of the BE functions, block size, pilot positioning, and the pilot pattern (sequence). It is therefore possible to find the best positioning scheme for the desired block size, BE model, and pilot sequence with a computer search. For simplicity, we limit the search for patterns in which the pilots are grouped in groups of length and these groups are spread throughout the block as evenly as possible. This means that the pilot positioning we find with this limited search is only optimal amongst all positioning with evenly spaced pilot clusters. However, all previous works on pilot positioning arrived at positioning schemes that are consistent with this structure. It turns out that the best positioning scheme is obtained with for all tested block sizes. It is interesting to note that this result is identical to the result in  which was obtained using different channel model and criterion. This expression is deterministic and depends only on the BE functions, block size, noise variance, channel order ( ), Doppler rate, and pilot sequence. It is therefore possible to find the best pilot positioning for a particular set of parameters by evaluating (37) for various . As we did in the previous section, we limit the positioning patterns for patterns in which the pilots are grouped in groups of length , and these groups are spread evenly throughout the block. This positioning strategy coincides with the pilot positioning in  for , with the pilot positioning in  for and with the pilot positioning in  for . In addition, every group of pilots is a Barker sequence of length . Barker sequences are known to enable good channel estimation because of their autocorrelation properties. Define the positioning metric as the value to be minimized in (37). A typical behavior of this positioning metric is shown in Figure 2 (based on (37) and in agreement with simulation results). Pilot positioning metric (the value to be minimized in (37)) for various , block size = 512, 5% pilots in the block, channel order , equal average energy paths, number of basis functions . The optimal positioning strategy is shown to be dependent on the Doppler rate and the number of pilots in the block. 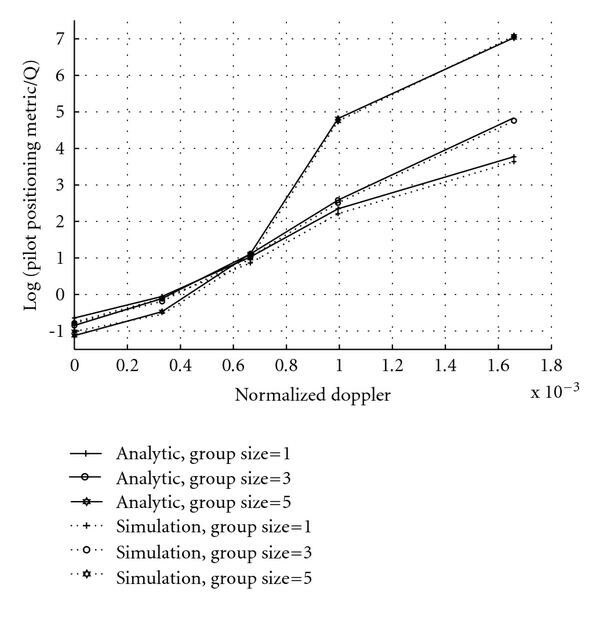 As can be seen from Figure 2, for low Doppler rates it is better to use group of pilots as also indicated by [29, 30] (although the difference is not very significant, at least for short delay spreads). For high Doppler rates and a small number of pilots, however, it turns out that using leads to much better results. This is because there is a tradeoff between accurate estimation of the multipath at specific points in time (that is better achieved by grouping the pilots) and tracking the channel time variations (that is better achieved by spreading the pilots throughout the block). Our results indicate that for high velocities using leads to a lower metric value as this means better ability to track time variations. Note that this result is obtained for severe ISI channel with three equal energy paths (and similar result was obtained for channel with 5 equal energy paths). We have also simulated channels with less severe ISI (that is, decaying power profiles), and the advantage of using was even larger, as could be expected. The switching point (Doppler rate beyond which it is advantageous to use ) is dependent mainly on the percentage of pilots in the block. For larger number of pilots, the switching point will occur at higher Doppler rate. The reason is that for large number of pilots there will be sufficient number of groups in the block to allow tracking of path time variations even when the group size is kept , so both multipath profile and time variations could be estimated accurately. We, however, are interested in the smallest number of pilots that enables good performance, and in these conditions, is advantageous even for moderate Doppler rates (see Figure 2). This conclusion is somewhat surprising as it is different from previous conclusions in [29, 30]. However, these previous works used different channel models and performance criteria. Moreover, both works considered only pilot groups equal to  or  or longer, to facilitate their analysis. where . This number was tested numerically to enable good accuracy description of the channel with the BE complex exponents and polynomial functions (below 1% error). This is also the number of basis functions used in . For the selection of eigenvectors as the functions set, we could have decreased this number slightly. We present simulation results for the following equalization algorithms. Maximum Likelihood equalization using perfect channel knowledge. Maximum likelihood equalization with channel estimation based only on the pilots. This is identical to the first iteration of the proposed algorithm. Time-varying BW algorithm with BE based on complex exponential functions (13) (BW-BE-exp). Time-varying BW algorithm with BE based on complex exponential functions (13) and initial channel guess identical to the true channel (BW-BE-exp & perfect init.). The difference between the error curve of this simulation and the previous one will indicate if we have an issue of convergence to a local maximum. Time-varying BW algorithm with BE based on polynomial functions (14) (BW-BE-poly). This might be considered a significant improvement of . Time-varying BW algorithm with BE based on optimal basis functions (BW-BE-eig). Non-time-varying BW algorithm based on dividing the data blocks into shorter blocks in which channel is assumed to be constant (BW-SB). This is essentially the method of . The BW-RLS method in  (called APP-SDD-RLS in ). This method was initialized using the same initialization scheme we used for the BW-BE methods. After the parameters of the BE are found, the actual channel responsed estimate is computed for every time instance. Finally, the BCJR algorithm uses this estimate to calculate the transitions probabilities which are the starting point for the BW-RLS in . Per-survivor processing with RLS channel estimator [8, 9]. Iterative Viterbi-based equalization with BE-based channel estimation. Reduced complexity variants of this algorithm appeared in [14, 18]. Simulation results for various signal-to-noise ratios (SNR) are presented in Figure 3 for block size of 256 symbols, 20 pilots (about 8% pilots), and multipath channel with three symbol-spaced paths with power profile dB. The proposed BE-based EM algorithm performance is very close to the performance of a nonblind ML equalizer with perfect channel knowledge for both complex exponentials and polynomial BE functions. The BW-RLS method and the BW-SB have similar performance. This is not surprising as the BW-RLS method can be considered a non-time-varying BW that operates on a (exponentially weighted) sliding block whose length is proportional to the forgetting factor used. The BW-RLS can be therefore considered as a generalization of the BW-SB. The PSP-RLS method exhibits poor performance in these scenarios as the RLS component is not able to track the fast fading. The performance of Vit-BE is closer to our proposed methods although still significantly inferior. This is because the channel estimation part uses only hard decisions and does not weight the probability of different hypothesis for the transmitted sequence. The training based ML equalizer has the worst performance as the number of pilots is not sufficient for reliable channel estimation. It is therefore evident that the proposed semi-blind approach can reduce the number of required pilots significantly thereby increasing the available bandwidth for information. Performance of various equalization schemes. Block size = 256, number of pilots = 20, pilot positioning scheme: , channel profile = [0 −3 −3] dB. Similar results were obtained for different channel profiles and delay spreads. For example, Figures 4 and 5 present the performance of the proposed algorithm for two equal power taps and four equal power taps, respectively. It is clearly shown that the proposed algorithm outperforms all previously proposed schemes that were simulated. Performance of various equalization schemes. Block size = 256, number of pilots = 20, pilot positioning scheme: , channel profile = [0 0] dB. Performance of various equalization schemes. Block size = 256, number of pilots = 20, pilot positioning scheme: , channel profile = [0 0 0 0] dB. 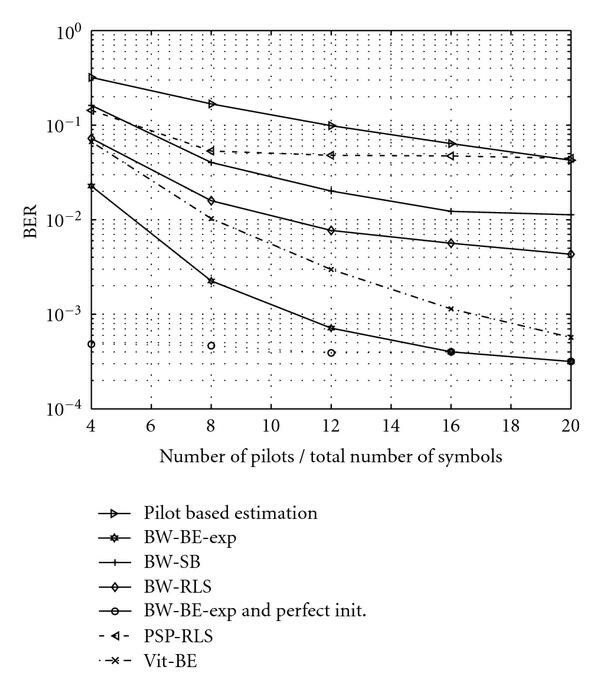 Results for block size and are shown in Figure 6 for various numbers of pilot symbols (the zero pilot percentage point in the figure corresponds to totally blind case and uses random initial guess). It is shown that in these conditions, our proposed method requires about 12% pilots to achieve close to optimal performance while Vit-BE requires up to 20% pilots to reach comparable performance and the other methods performance is even worse. Training-based equalization does not produce reliable results because the fast fading channel necessitates an excessive number of pilots for reliable estimation and tracking of the channel throughout the block in these conditions. Performance of various equalization schemes as a function of the pilot percentage in the block. Block size = 256, SNR = 12 dB, pilot positioning scheme: , channel profile = [0 −3 −3] dB. Results for various block sizes are shown in Figure 7. The performance of the proposed method improves with increasing the block size even though this means more functions are needed for modeling the time behavior of the channel. The reason is that the larger block size enables better filtering out of the noise as well as benefiting from more pilots in the block. All simulated methods reach a saturation point beyond which it is not beneficial to increase the block size further. The proposed method is shown to reach this point for smaller blocks thereby enabling latency reduction. 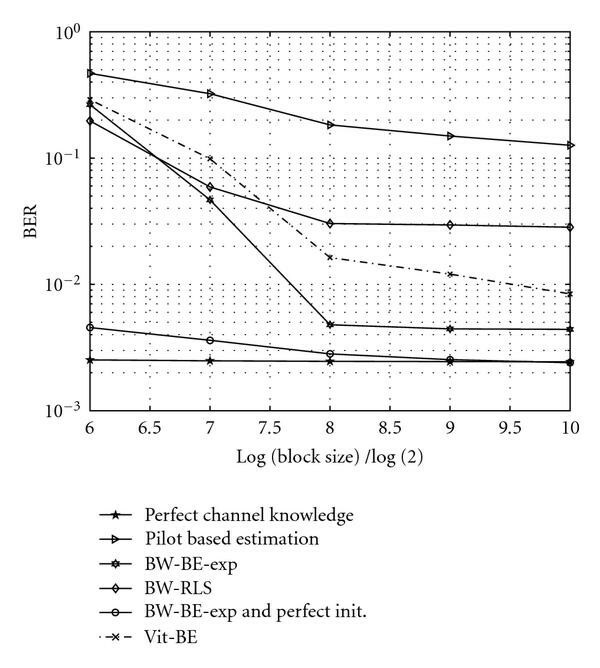 From other simulation results (not shown here as they resemble the results presented so far), it is concluded that the proposed methods of BW-BE are superior over all simulated previously proposed methods in a large range of block sizes, pilot percentages, and channel profiles. Performance of various equalization schemes as a function of the block size. Pilot percentage = 8%, SNR = 9 dB, pilot positioning scheme: , channel profile = [0 −3 −3] dB. 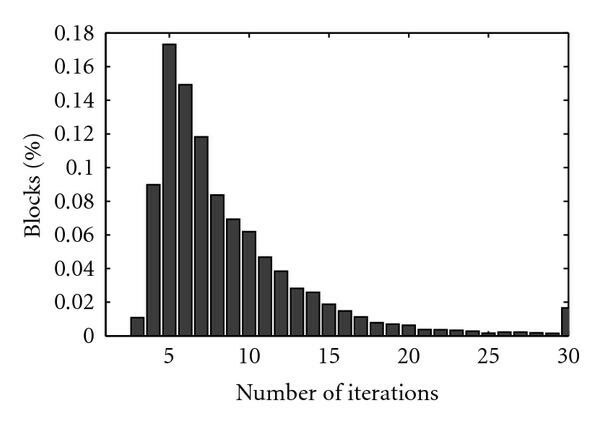 Finally, although a detailed convergence analysis is beyond the scope of this paper, a histogram of the number of iterations required to achieve convergence is plotted in Figure 8. This plot is for and under the same conditions as in Figure 3. Convergence is determined based on the Q function value, defined in (8). Convergence is assumed when the ratio of two function values of two consecutive iterations is sufficiently close to one, that is, less than . The maximum number of iterations allowed in this plot is 30. It is shown that about 75% of the blocks converge with 8 iterations or less and 90% of the blocks require 15 iterations or less for convergence. These results can be used to evaluate the computational complexity of the proposed algorithm. Number of iterations required for convergence with block size = 256, SNR = 12 dB, channel profile = [0 −3 −3] dB. A novel method for maximum likelihood semi-blind joint channel estimation and equalization for doubly selective channels is proposed. This method is based on expectation maximization (EM) principle combined with a BE model of the doubly selective channel. It is shown that the main drawback of the proposed approach is its possible convergence to local maxima. To alleviate this problem, we propose an initialization scheme to the equalization based on a small number of pilot symbols. We discuss the selection of basis functions set and find the optimal basis set. We further derive a pilot positioning scheme targeted to reduce the probability of convergence to a local maximum. The resulting algorithm is shown to be significantly superior over previously proposed equalization schemes and to perform in many cases close to an ML equalizer with perfect channel knowledge. In this appendix, we highlight the differences between the algorithm proposed in  and the algorithm presented in this paper. For simplicity, we discuss only the non-time-varying case as the generalization to time-varying case is straightforward. Comparing (A.5) to (A.1), we see that the two methods are not equivalent. Moreover, the method in  converges to the true BW only when is constant for all values of . This is likely to happen for long blocks. However, for short block it is not necessarily true and in this case the approach presented in  leads to a suboptimal solution. By combining the results from (C.6) and (C.7), it can be verified that (21) is identical to (B.6) for this particular choice of branch metrics. Parts of the paper were presented at ISCCSP2008 . This article is published under license to BioMed Central Ltd. This is an open access article distributed under the Creative Commons Attribution License, which permits unrestricted use, distribution, and reproduction in any medium, provided the original work are properly cited.